So with all the labels tossed around in this latest campaign of the Great Culture War, it can sometimes be difficult to discern exactly what someone is talking about when they use one of the current buzzwords describing the opposition. Take, for example, “Social Justice Warrior”. SJWs, for short, are pretty much the villain du jour of… well, an awful lot of people opposed to a particular brand of cultural authoritarianism, who would rather people grow thicker skins than campaign to have everything potentially offensive removed from the public sphere. Nevermind that you can usually find someone to be offended by pretty much anything. But what does that mean? What does an “SJW” look like, sound like, act like? How does one turn the arguable virtue of campaigning for social justice into a vice? Cab driver has hula doll on dash. Woman berates driver over hula doll. Driver refuses to take down hula doll immediately and perform sufficient abasement at the Altar of Equality. Woman threatens to ruin man’s life. Man ejects woman from car. Woman claims to be victim. This all went down in March of this year, though the video has just now surfaced, sent to professional right-wing provocateur Lauren Southern, who promptly posted it online, because despite Annaliese Nielsen’s intent with recording the video, she doesn’t exactly come out of it looking like the hero. To continue my wager, I’d bet that she shared it with a few friends, and they told her pretty much what I just said: You may have a legitimate complaint regarding the doll, but this video does you no favors. Don’t post it. And to close it out with one last bet, I’d say that she managed to piss one of those friends off enough that they decided to use it to enact a little semi-anonymous revenge. Which led us to where we are now, with Annaliese promptly going silent on Twitter and protecting her tweets, preventing people from mining them to provide ammunition for even more attacks, while a parody account using her former Twitter handle appears to be tweeting out exactly the sort of thing you’d expect a “typical SJW” to say. At least I hope it’s a parody account. Because any other explanation raises the question of how such an individual could have survived childhood without choking to death on a Duplo block. So. Why am I participating, albeit in a somewhat limited form, in what is going to be an internet dogpile of moderately epic proportion? 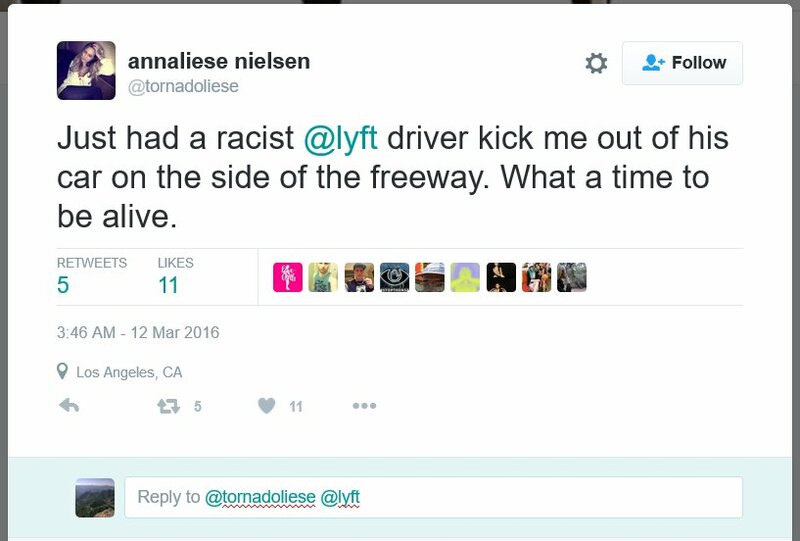 Because like the title suggests, Annaliese Nielsen serves as the Platonic Form of an SJW. Of what an awful lot of people dislike about the social justice movement, of the sort of condescending, patronizing “debate” tactics that drive people away rather than bring them around. Of the sort of “crybully” behavior, the screaming hypocrisy of declaring oneself the victim in a sought-after conflict. And because, as an added irony, she reveals herself as deeply classist in the process. Think about it: she treats the driver as a menial. I doubt she even looked at his face for more than a second before she got in the car, once she knew that this was, in fact, the Lyft ride she had called. It’s probably part of why she just assumed an Asian man was white, since she never bothered to look at him. One doesn’t need to bother looking a menial in the eye, after all. She insists that he has to take her to her destination, because that’s his job, after all, despite the fact that he has the right to insist she exit the vehicle. She demands his name, attempts to get his license plate number, all with the intent (at the time) of using that information to destroy him. And to put the cherry on top, as if she were trying to fill out some sort of “how not to act” Bingo card, she demanded the name of her fellow passenger, a defender of the driver, undoubtedly for exactly the same reason. It’s funny sjws, seem to me to be the most racist/sexist individuals currently.